The Rabbi with a Blog (Rabbi Jason Miller): How Can Lox Not Be Kosher? How Can Lox Not Be Kosher? 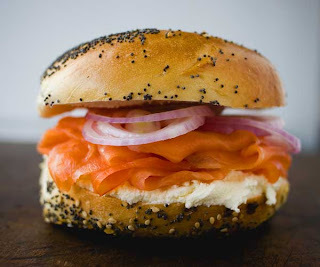 Smoked salmon, or lox, has long been known as a staple fare at Sunday brunch in Jewish homes. In fact, Jewish people who claim their Jewish identity as only secular are known as "Bagels and Lox Jews." Well, now an ultra-Orthodox group of rabbis, the Chevra Mehadrin of Monsey, New York, have included lox on a list of food items that should no longer be considered kosher. According to these rabbis, a tiny parasitic worm called anisakis that can be found in smoked salmon calls its kosher status in question. NBC New York interviewed some individuals in the Kosher industry who were less than appreciative for this ruling. "From time to time there are organizations who get a little crazy with these ideas," said Hal Simon, manager of Ben's Kosher Delicatessen in midtown Manhattan, who sells lox daily. When matters like this arise in the world of kosher certification, I usually consult two of my Talmud teachers from the Jewish Theological Seminary for their opinions. However, based on many prior conversations with them I can pretty much guess what their responses will be. Rabbi Joel Roth, who is the highly regarded kashrut expert for the Conservative Movement will say this is narishkeit (foolishness in Yiddish). Prof. David Kraemer, author of Jewish Eating and Identity Through the Ages, will no doubt have a lot of eye rolling commentary about this latest pronouncement by the ultra-Orthodox kosher police. In his book about kashrut and Jewish eating as an identity, Prof. Kraemer devoted his entire last chapter to this particular subject. Titled "Bugs in the System," he opens the chapter by recounting the New York Times article from June 1, 2004, which reported that New York City drinking water had ceased to be kosher because of millimeter-long zooplankton called copepods. He writes, "How is that water that had been drunk for generations without hesitation or compunction was all of a sudden suspect, and even 'non-kosher?' Examined by itself, this chapter in the development of modern kashrut practices is a study in different interpretations of detailed legal sources. But studied in context, the copepod incident is the culmination of a not-so-long history of increasing alarm and accusation over kashrut in the Orthodox community and beyond." Indeed, Kraemer goes on to address the relatively new (mid-1980's) preoccupation the Orthodox have with the potential for bugs rendering vegetables as un-kosher. A year ago, I was interviewed by a Detroit Jewish News reporter for an article she was writing on my kosher certification business, Kosher Michigan. Due to pressure from Detroit's Orthodox kosher certification group (the Vaad), the article was never published. However, when I asked the reporter what the Vaad's representative said when she interviewed him, she replied that he didn't question my knowledge of kashrut law; but suspected that, as a Conservative rabbi and mashgiach (kosher supervisor), I wouldn't find it necessary to check the vegetables for bugs. I have no doubt that Kraemer would have included the recent proclamation that lox are no longer kosher in this chapter. It is further evidence of the ultra-Orthodox blurrying the kosher regulations and prioritizing the wrong message. What I find ironic about this is the ultra-Orthodox's reliance upon new technology to apply further strictures upon the already nuanced system of kashrut. Modern scientific knowlege could be applied by them to reverse the centuries-old ban in the Ashkenazic Jewish world on kitniyot (legumes) including peanuts during Passover, which Kraemer also addresses in the same chapter ("Of course, if Rabbi Moshe Feinstein approved of the kashrut of peanut oil on Passover, there is no question that it is kosher."). Rather than use new information and scientific innovation to make it easier for Jews to observe the kosher laws, the ultra-Orthodox have used microscopes to render tap water, Brussels sprouts, and smoked salmon unfit for consumption by the kosher observant Jew. And therein lies the reason that the most common questions I field in the months leading up to Passover all have to do with the acceptability of food items deriving from leguminous plants that techically cannot be chametz (leavened) as they are not derived from the "five grains" (wheat, spelt, barley, oats, or rye). So, from now on when a secular Jew cites their love of eating lox as their Jewish identity, will you have the heart to let them know that those lox aren't even kosher anymore? Response to a question I had about sea salt... I had an allergic reaction and tried to trace the source... Google told me some seasalt contains microscopic amounts of shellfish. "…contains microscopic shellfish and that was the source. I am curious if this is true, given that CRC certifies it as kosher. Are the levels low enough that the product is still kosher?" Halacha mandates that we are concerned with anything that the human eye can see, which excludes microscopic particles. Therefore this is not an issue. If we were to suspect microscopic particles, then this would exclude us from eating or drinking just about anything. What JTS and the RA have to do is to disavow any hechsher but their own, on the grounds that the perpetrators of what you rightly call narishkeit are cultists who have no concept of normative Judaism. Such a fascinating article. It's interesting to pose new technology microscopic examination against this: My father advised me that one should not use margarine on a dinner roll with a steak dinner because it would give the appearance of a transgression. I think it brings to light that it is living a Jewish life is not a purely a scientific endeavor. We should do what we can do, and I suppose we depend on these organizations to sort out the food industry where we cannot. After all, we are no longer an agrarian society and we are far removed from the source of meat, for instance. But my point is this, while we can use modern technology to speed up the process, should we really be inventing processes that can actually change things categorically?